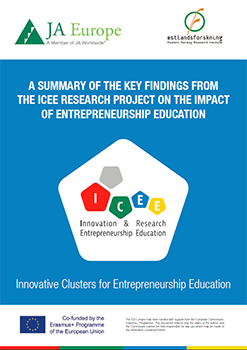 The ICEE (Innovation Cluster for Entrepreneurship Education) international research project was led by JA Europe and included 4 Ministries of Education (Estonia, Finland, Italy and Latvia) and Enterprise Flanders (representing the Ministry in Flanders, Belgium); 3 research institutes and 5 national JA organizations. Thanks to the enthusiasm and professional work of the consortium, the project reached out to 12,000 students, parents, teachers and business volunteers, worked with 25 schools and conducted 150 in-depth interviews. We extend our gratitude to all of teachers and head teachers in each of the schools who made the research such a success and special thanks to all partners of the consortium who made this possible! The main purpose of the ICEE project is to understand how we can move faster towards the European goal that every young person should have a practical entrepreneurial experience before they leave school. In the ICEE project, we tested what the scenario would look like if 50% of students between 15 and 20 years old had such an experience. • We found that quantity is essential if practical entrepreneurship projects like mini-companies are to make an impact for the individual and society. A deep dive is better than a light touch. • One often-heard concern towards introducing entrepreneurship education in school is that it may “steal” time from other important work at school. Neither in the qualitative research, nor in the quantitative research, did we find any indications or findings to support this concern. • Students provide positive feedback on the CP-method and the learning outcomes. Students appreciated the project time span (one academic year) and the complex work. The students underlined that it takes passion, hard work and long hours to carry out their initial idea, and their level of engagement is high. • Teachers, students and parents in all countries mention a wide range of learning outcomes, such as knowledge (how to start and run a company); generic skills (creativity, conflict solving and presentations), and attitudes (school motivation, responsibility, self-efficacy and self-confidence). Both students and teachers mention that a by-product of this process, was more students coming to understand the usefulness of other subjects they were being taught. • Teachers, parents and business volunteers score the program in a very positive way, and once involved, they seem to want to continue. The relationship between teacher and student seems to shift in positive ways. • We also found many positive indications that reaching 50% of the students in a year in a school made a substantial impact on the schools’ organization and also changed teachers’ attitudes in many areas. The final ICEE research report will be released in February. A summary of the some of the findings can be found HERE. Furthermore, the qualitative report based on 150 interviews is found here.